Details relating to the Luxembourg Commemorative of 2005. 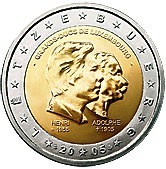 The coin commemorates the 100th anniversary of the death of the Grand Duke Adolphe, the 50th anniversary of the birth of Grand Duke Henri as well as Henri’s fifth year as the reigning monarch. In the inner circle the head of Henri is shown superimposed on the head of Adolphe. Under the heads are the respective names and in the case of Henri the date of birth and in the case of Adolphe the date of death together with a cross. Around the upper edge of the inner ring is the inscription “GRANDS*DUCS DE LUXEMBOURG”. This is a little unusual as all subsequent commemorative coins of Luxembourg only bore the country’s name in the local language. Far more unusual and subsequently prohibited is that the country name and the date of issue appear in the outer ring where letters and numerals alternate with the stars of the EU. It was thought that this ran against the concept of unity within the EU. From Luxembourg Commemorative 2005 to euro coin collector.